Brussels also known as Brussels-Capital region is the capital of Belgium. The city is one of the most energetic centers for technology and innovation. Due to various technological institutions in Brussels, it is important for young professionals to pursue the Certified Scrum Developer Certification in Brussels. Enrolling for the CSD training provides a competitive advantage in one's career. The CSD training in Brussels is a five-day program that is taught by industry expert tutors. The trainers usually begin with the basics of scrum principles and then move onto more complex topics. The academy workshop will help you demonstrate your understanding of scrum roles and ceremonies. Once the scrum principles are clear, the course moves towards agile architecture and design. The CSD course in Brussels is a uniquely designed training program. Available at a fair cost, the Certified Scrum Developer training in Brussels provides numerous advantages in one’s career. In such a competitive setup of today, such skills are much needed if you want to distance yourself from the crowd. With the help of the Certified Scrum Developer training in Brussels, you will be able to apply the scrum fundamentals in daily activities which helps put better designs in place while developing. The training creates a positive Agile mindset that improves team cohesion. This not only pays dividends individually but helps the overall organization in manifold ways as well. 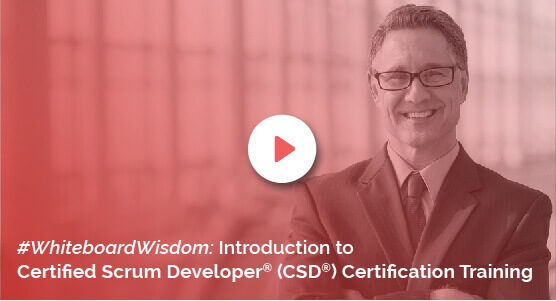 The CSD certification in Brussels by KnowledgeHut provides the applicant with necessary lectures to understand the basics of scrum and materials that help implement the practice of just in time development. Enroll immediately for the CSD course in Brussels to gain a competitive advantage.